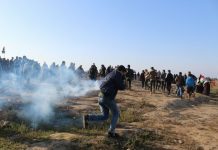 Israeli occupation forces (IOF) have escalated attacks and retaliatory acts against Palestinian civilians in the southern Gaza Strip town of Khan Yunis for the second consecutive day, causing more casualties. The number of Palestinians killed by IOF in al-Amal neighborhood and Khan Yunis refugee camp has mounted to 10. In addition, 27 Palestinians, including 6 children have been injured. IOF have continued to destroy houses and the civilian infrastructure in the two areas. PCHR warns that the intensive deployment of IOF in the two areas can cause more casualties among Palestinian civilians. A high ranking officer in the Israeli military stated that “the army will not leave Khan Yunis before significantly weakening the ability to launch projectiles.” He also talked about a wide scale operation in the area. PCHR believes that the excessive use of force by IOF, including the employment of military aircrafts, helicopter gunships and tanks, reflects the intention by the IOF to cause maximum casualties among Palestinians. 3. Amjad Subhi ‘Arram, 22. A fourth member of the resistance was seriously injured. 2. Mohammed Mahmoud Abu Khurais, 25. As a result of indiscriminate shelling by IOF, 14 Palestinians, including 3 children, have been injured. Thus, the number of Palestinians injured since the beginning of this latest offensive by IOF has mounted to 27, including 6 children. IOF have continued to destroy Palestinian houses and civilian property near the old market in al-Amal neighborhood. They have also destroyed the fences of a number of houses near the housing project of al-Amal neighborhood. Dozens of families have become homeless as IOF have destroyed their houses. The amount of damage caused by IOF in the area has not been estimated so far, due to the intensive deployment of IOF in the area. Palestinian medical crews have faced extreme difficulties in reaching the affected areas due to the continuous shelling by IOF. PCHR is gravely concerned for escalation of attacks by IOF in the Occupied Palestinian Territory (OPT), especially in the Gaza Strip. 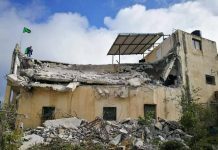 PCHR warns of retaliatory acts against Palestinian civilians and property, which violate international law and international humanitarian law. PCHR also reminds the international community and the IOF that these actions violate the Fourth Geneva Convention of 1949 Relative to the Protection of Civilian Persons in Time of War, in particular Article 33 which prohibits collective punishment. PCHR reiterates its call for the High Contracting Parties to the Convention to fulfill their legal obligations to ensure respect for the Convention and take effective steps to stop grave breaches of the Convention perpetrated by IOF in the OPT.